Other than writing of course, my 3 main passions in life are chocolate, champagne and fashion; the week before last provided me with all three! 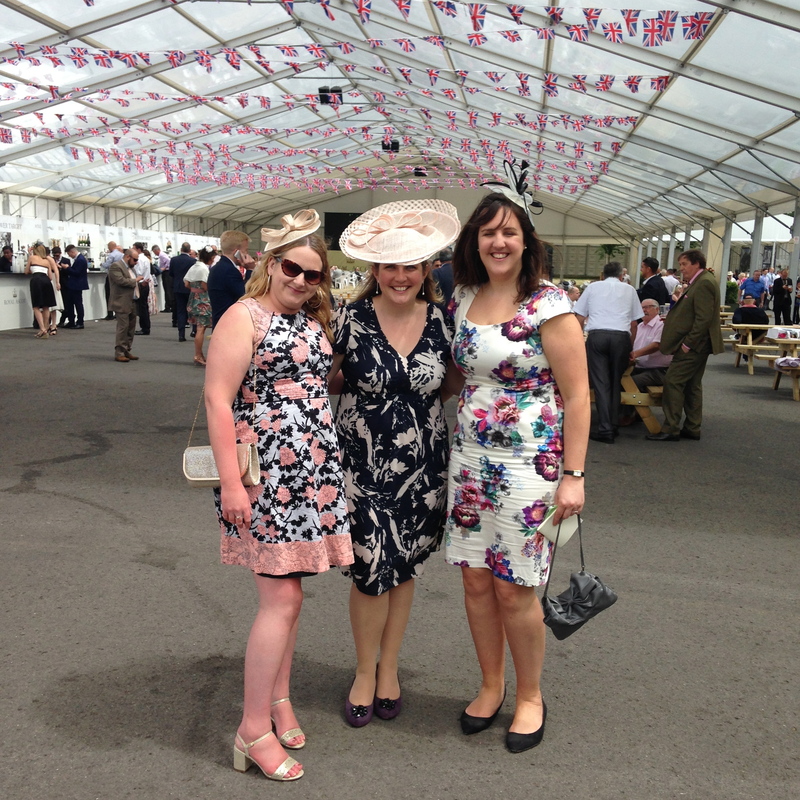 A group of 8 of us visited Royal Ascot. I have visited before – see previous blog but this was an altogether new experience as we were in the Silver Ring rather than the Grand Stand that we were before. This essentially means that you are allowed to bring a picnic and 1 bottle of sparkling wine or champagne per person as well as spectating on the grass. The day was overcast and quite chilly to start, making me wonder if I should have brought my pashmina. It was also rather windy much to my friend’s annoyance as she had a large fascinator which kept blowing off so she spent most of the day chasing it before finally admitting defeat and taking it off. For once in my life and to my husband’s great delight, I wore an Oasis dress I already had that I wore to my Brother’s wedding. I accessorised with a gold clutch also from Oasis, a gold fascinator from House of Fraser and some block heel gold sandals from New Look. I bought these shoes especially as I thought I wouldn’t have much fun with stilettos on grass but still wanted a bit of a heel. Block heels seem to be the heel of choice this season anyway. On arrival we set up our picnic (we had enough food between us to feed an army!) and relaxed over copious glasses of champagne (we had 7 bottles to work our way through! )and a jug of Pimms whilst catching the sun. Despite the clouds I still managed to burn my shoulders quite badly! We all enjoyed observing some of the outrageous hat choices; one girl had a huge white feather hat and as she tried to enter the Grand Stand – discovered it wouldn’t fit through the door! Another had a 50’s style dress in a cherry pattern and a couple of huge cherries on her head. It was lovely to see the Royal parade where the queen was about 12ft from us – the closest I’m ever likely to get. 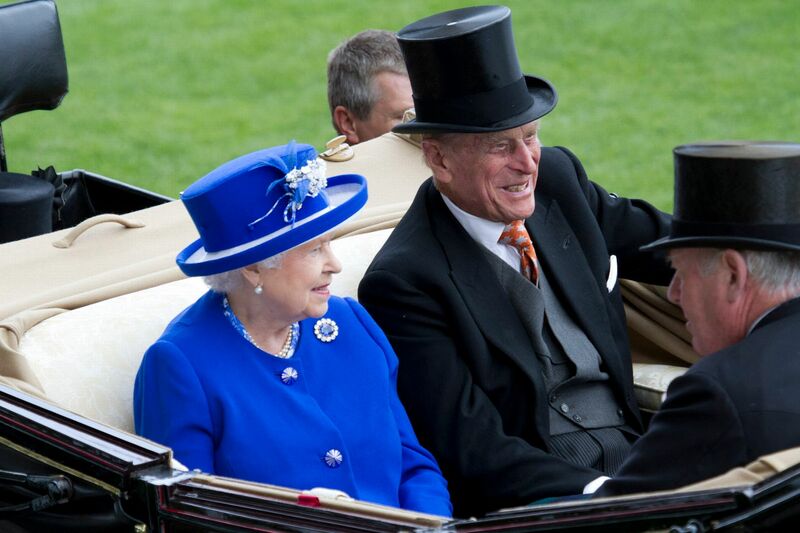 She really is fabulous for 89 and still looks effortlessly stylish in this gorgeous blue ensemble. It was quite a patriotic moment when we all stood for the national anthem. 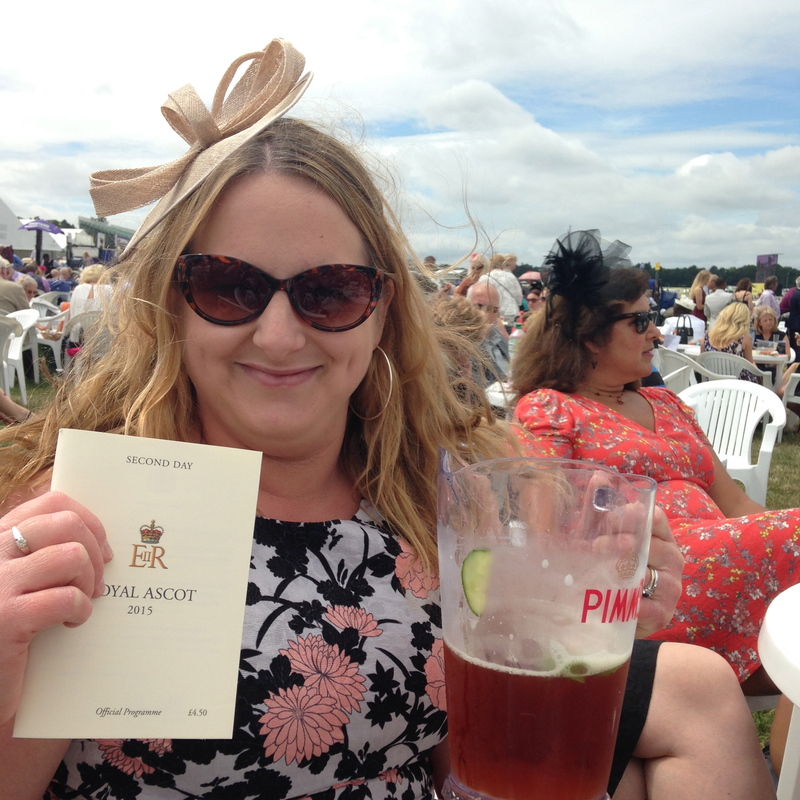 The racing is an added bonus to a fashion and drinking affair. I bet on every race and had a couple of very tiny wins but it’s not the winning that counts! Who am I kidding – I would have loved a big win. 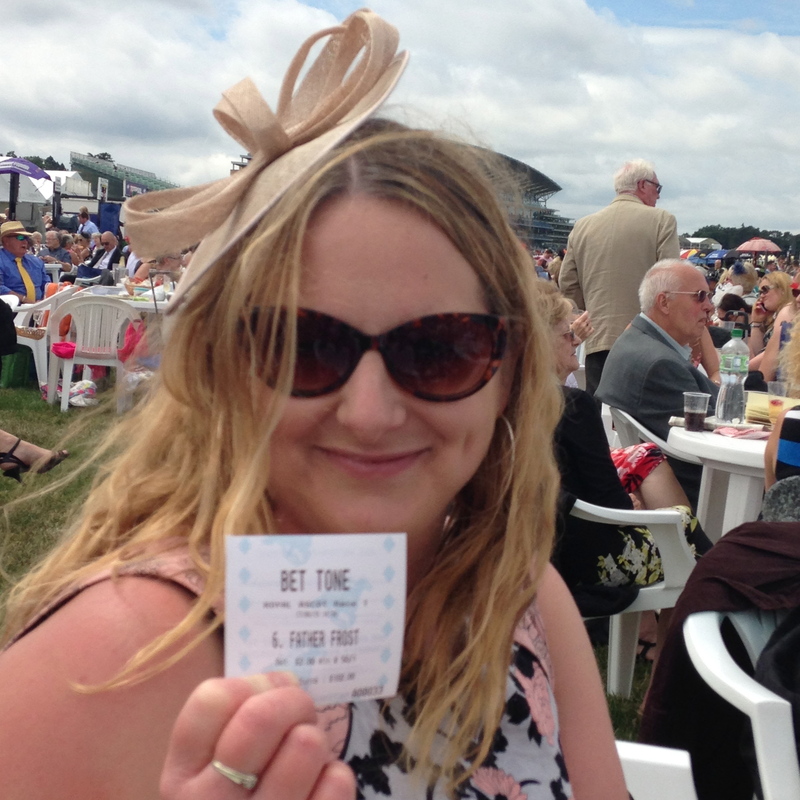 None of us won any substantial amounts but we all had a fantastic day and I thank my friend Sarah for organising it. 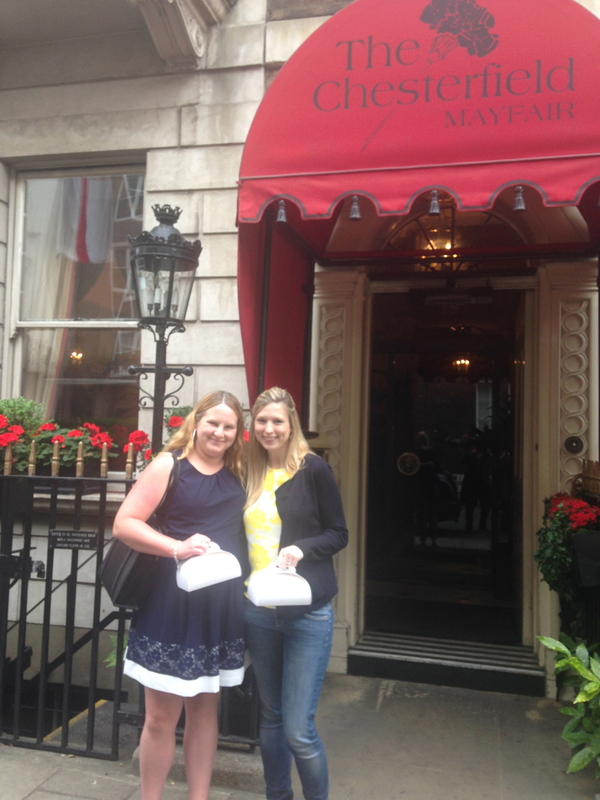 The weekend before last my best friend and I went for afternoon tea at The Chesterfield Hotel in Mayfair, London. Our birthdays are in May and July respectively so we usually try to arrange a treat by way of celebration in-between the two – i.e. June. 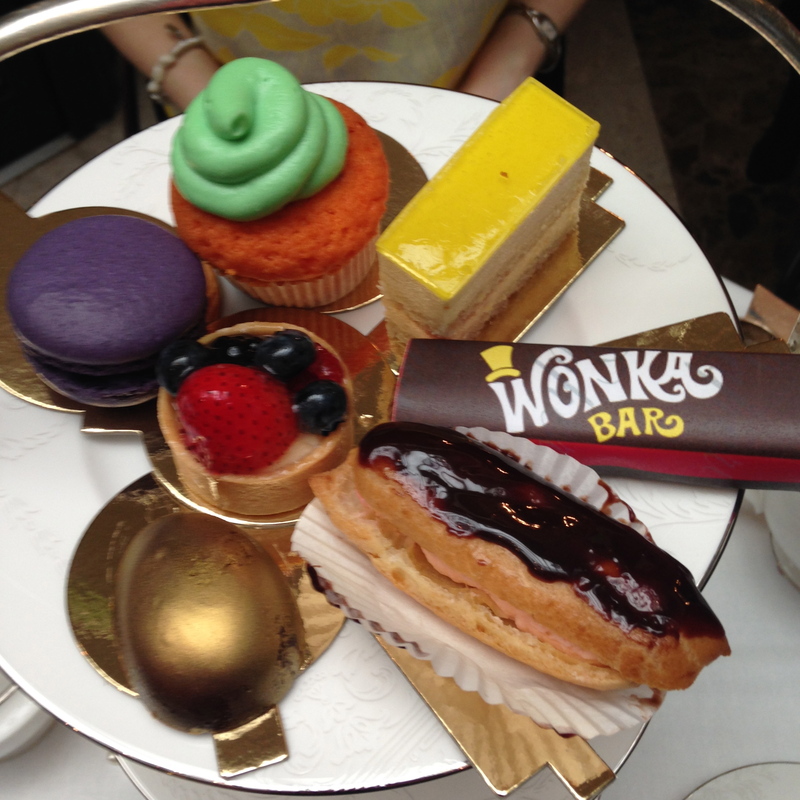 This was no ordinary tea; it was a Charlie and the Chocolate Factory themed tea!! I wore a navy dress from Just Perfect, a small boutique in Rochester and my current favourite summer staple – silver butterfly flip flops from Oasis. Charlie and the Chocolate Factory by Roald Dahl was first published in America in 1964 and England in 1967. The dark tale of children who win a visit to Willy Wonka’s chocolate factory after finding a golden ticket in a Wonka bar has captivated children for decades and there have been two film adaptations and now a musical, currently running at The Theatre Royal in Drury Lane. 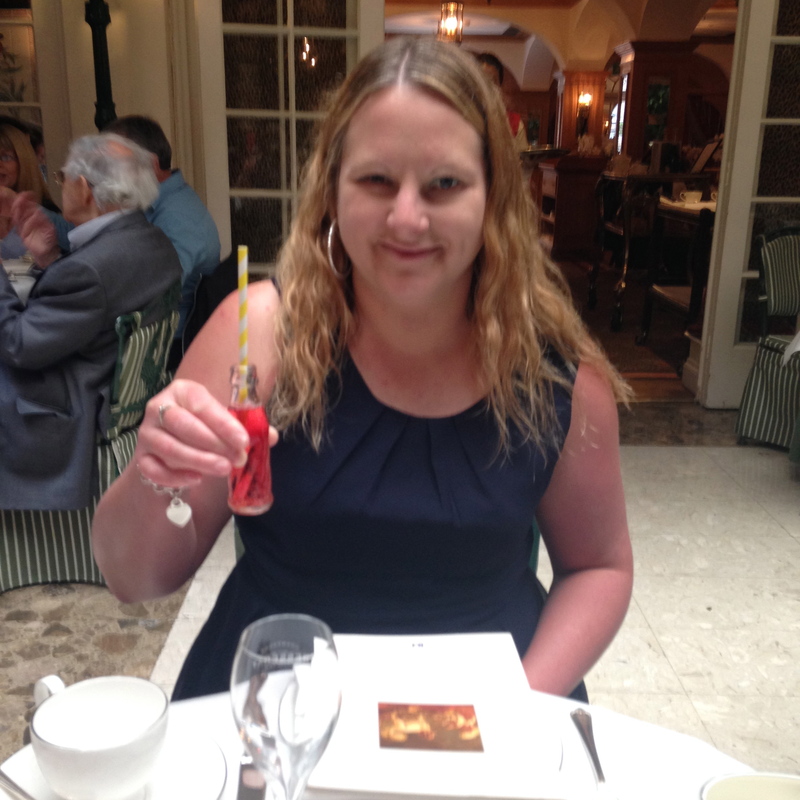 Upon arrival we were each given a fizzy lifting drink – it tasted like strawberries and had popping candy in it. 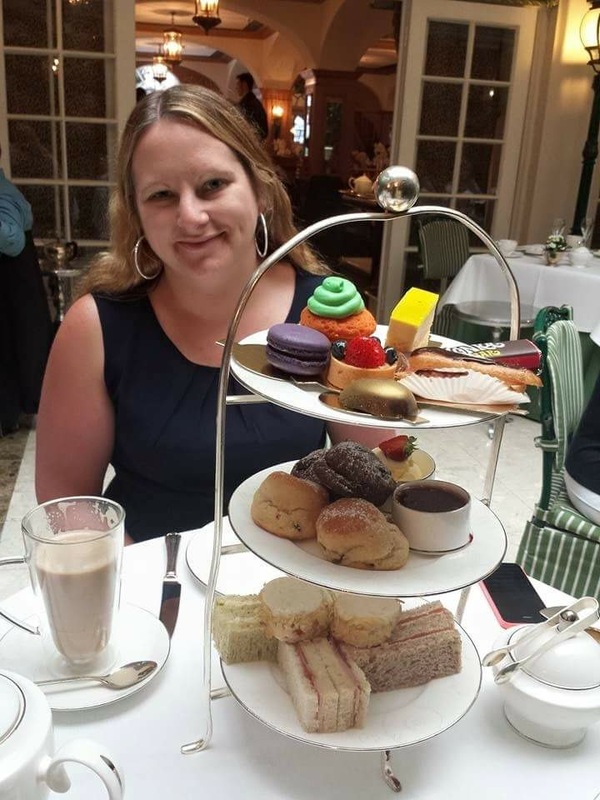 We were then offered a choice of teas and coffees – you could have even had a chocolate tea but not being a tea lover, I decided to abstain. The stand of food was then brought over, containing the usual complement of sandwiches – cucumber, salmon, ham etc. The next layer was the usual scones with cream and jam although there were also two chocolate scones. I had never tried a chocolate scone but it was quite delicious. The top layer was where the theme really came into its own. There was a golden egg, an oompa loompa cake which was orange sponge with chocolate inside and green fondant on top. 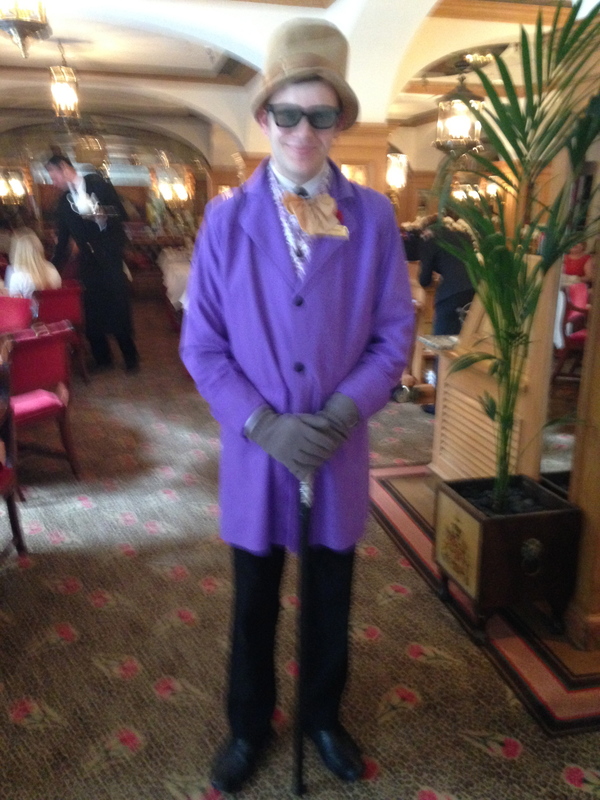 There was a blueberry macaroon, a bubblegum éclair and of course a Wonka bar! The best thing about this tea over any others I have been to was that they were willing to top up any of the layers and even give you a doggy bag. Before you leave you have the chance to pull your very own golden ticket from a hat. This is an envelope containing a free gift for the next time you visit – however you don’t know what you’ve got as you can’t open it until you arrive for your next visit. If you are not thoroughly stuffed by the time you leave, you are then invited to help yourself to a selection of traditional sweets including fruit salads, shrimps, white chocolate mice and drumsticks. To finish off the most wonderful experience, on the way out, we met Willy Wonka himself! I whole heartedly recommend this tea to adults and children alike and it has certainly made me want to see the musical. That concludes my week of indulgence; as the old saying goes ‘a little of what you fancy does you good’ – it’s the huge quantities I ingest that does the damage!